Many of physical education's benefits are well-known, such as improved strength and flexibility. It also is known to reduce stress, improve concentration and lift mood, as well an expand lung capacity and slow the heart-rate. Students participate in daily physical activities. Although P.E. is being phased out in many public schools, its benefits—from skill development to the creation of lifelong healthy habits—are well documented. At CNS, we believe it is important to cultivate daily habits for a healthy mind and body. Every grade has two outdoor recesses each day, weather permitting. I was given the chance to step into the role of the upper class P.E. teacher towards the end of the school year (2016), and was thrilled at the opportunity to come back and take on 1st-8th the following year. I was a competitive gymnast growing up, and then coached club level gymnastics for 5 years. I try to draw from that experience as much as possible, and offer those strengths and flexibilities to our students. During P.E. 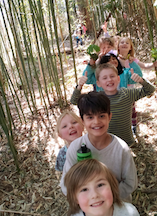 class we are able to take full advantage of the beautiful arboretum that abuts our school's playground. We hike, climb, and enjoy combining our P.E. and art class by enjoying nature walks and journaling. I like to let the kids create activities and show them that our physical health goes far beyond just playing sports. We do a lot of cooperative games and obstacles, yoga, and will be incorporating some cooking/health and wellness days to encourage our students to eat healthy and make good decisions when it comes to food and exercise.